Marcus Murphy played collegially at Missou. A dangerous and versatile player, Marcus scored TDs receiving, rushing, and returning punts and kicks throughout his career. He finished his college career with 357 carries for 1957 yards and 16 TDs, to go along with 50 receptions for 318 yards and 2 TDs in just 2 years. A 7th round pick of the New Orleans Saints, Murphy drafted to fill the role that Darren Sproles and Reggie Bush had before him. He spent the next two years as a return man on both kicks and punts, but couldn’t crack the runningback lineup. He’d finish with 34 kick returns for 318 yards and a 74 yard TD, and 19 punt returns for 405 yards. He’d be waived in 2017, and found his way onto the practice squads of the Jets, Colts, and Bills. Eventually the Bills decided to take a closer look at Marcus as a strictly a running back. He carried the ball 7 times for 41 yards and caught 2 passes for 7 yards in his Bills debut. Marcus made the roster of the Bills in 2018 and has seen a lot more playing time touching the ball 19 times in 3 games. 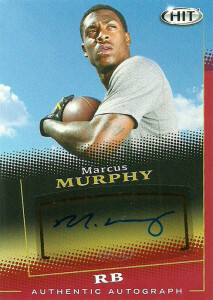 Great looking card here of Marcus. I just wish the rest of the Sage 2015 set was this consistent. The striking clouds and heroic pose by Murphy look like a pretty solid throwback to the old public relations photos.